I had a problem… okay.. okay.. so I have many problems… but let’s focus on one in particular or this blog post would never end… okay? Thank you…. Pretty easy.. nothing spectacular. So, what’s the problem? This is all fine and dandy, but I want to know what the total was for the entire week. Yes.. I realize the answer is 24 from my example… I mean, I know how to add! I just want SharePoint to display it for me for the executives (we all know, they have math problems). You may be thinking, hey genius (in a sarcastic tone of course), why don’t you just go to the view and total on the “Week Total” field. What a brilliant idea! Why didn’t I think of that… let’s go to the view and do just that…. Ohhhhhh… you can’t total on a Calculated Column.. it’s not even an option… Yeah… I had the same moment. So, what do you do? Well… what do you think I did? 4) Asked the question on twitter? Laura’s video was very easy to follow and was ALMOST exactly what I needed. She does a great job walking you through every step of summing up a calculated field which was PART of my problem. The other part was my list is grouped by date! 1. Click on the "chevron” (I didn’t know it was actually called that until I heard Laura say it).. I always call it the “little-button-in-the-top-right-corner-with-the-greater-than-sign”.. but “chevron” is much shorter. So, click on the chevron, click on “Sort and Group”. Then Add the field you want to group by, in my example it is the “Monday Date” of the timesheet entry. Make sure to check the check boxes for “Show Group Header” AND “Show Group Footer”. Click “OK”. Our final output has the summed hours for each group! Anyway, Laura did all the work, I just took it one small step forward… as always, feel free to leave any additional insights you may have. We’re all learning here! Not sure if this might help someone else but you can also do this easily with a workflow. This was the method I used way back as I like to avoid editing pages if I can help it in SharePoint Designer. This way you can just use as many views as you want and can use all out of the box web interface options. Adding Columns works fine. Just as it said. But what to do if you want to multiply the columns in the and display it in the same grouping. I've got an order administration. Grouped on Order ID. One order can hold 1 or more Items. At the footer of the group I want the total Order cost. I've used a similar solution but am running into issues when paging. The totals are bound by paging issues. Is there anyway to get this total value of a column in sharepoint list into SSRS(2005). Detail Info: I have 100 questions(columns) that needs a total for survey questions. "this will not work if you group by a person field. For some reason the person field does not go through each row in the group. I haven’t dug into this much yet. Maybe if I find some time… whatever that is"
Thanks a lot!!!! This was very helpufl! 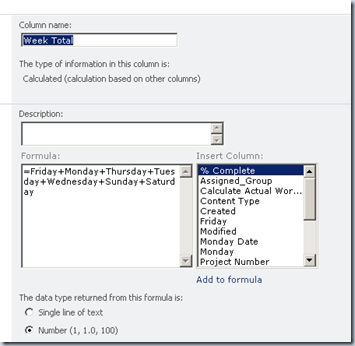 how do you create column monday day. whats the logic behind it. The most ridiculous thing in this world is for Microsoft to have all this money, software engineers... and not include an easy way sum SUM a calculated Column in INFOPATH/Sharepoint. Designing a CAR with no room for a driver seat.. .we'll just push it from behind. What are these people retarded? Is there some PATENT for summing a column and MS didn't want to pay the Licencing? WTF..
Hey Bill G., it's time to fire some people, don't you think? Anyone know a work around for INFO PATH? I want to make a simple Itemized list of Good and Service; Using a Growing Table. Each Row Calculates its subtotal by multiplying the price of the item by the QTY. INFOPATH won't sum the column. Is the a way to create a Variable or write the values to a temp file, then sum those values or variable?